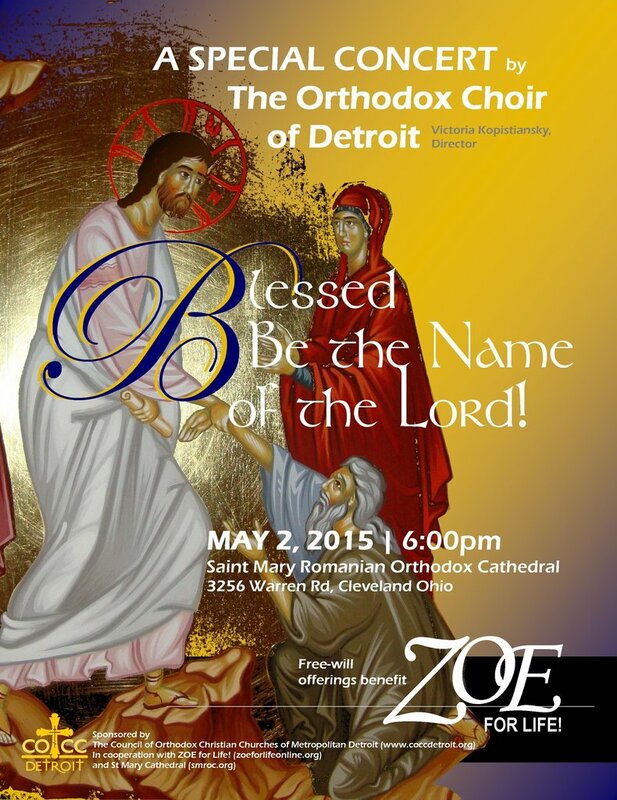 DETROIT, MI [COCC] -- The Orthodox Choir of Metropolitan Detroit (OCMD) will perform a concert of Orthodox Christian hymns and liturgical songs to benefit ZOE for Life! on Saturday, May 2 at 6 p.m. at St. Mary Romanian Orthodox Cathedral, 3256 Warren Road, Cleveland, Ohio. Based in Cleveland Heights, ZOE for Life! is an Orthodox charity that helps women with crisis pregnancy, offers shelter from abusive relationships and aids Orthodox Christian couples with adoptions. A Detroit-area chapter is being developed. The OCMD is composed of more than 40 volunteer singers from several parishes in southeastern Michigan. Under the artistic direction of Victoria Kopistiansky, it is regarded as one of the finest ensembles of its kind in the country. This concert will be its first outside of Michigan. The concert is open to the public free of charge. Free-will donations will benefit ZOE for Life! For directions and information, visit http://www.smroc.org, http://www.zoeforlifeonline.org or http://www.coccdetroit.org.